These No Bake Espresso Cheesecake Bites are so amazingly good! I can’t believe how easy they are to make, and how much easier they are to eat! These No Bake Espresso Cheesecake Bites are part of an awesome group of bloggers that have come together to bring you the BEST no bake desserts! Hop on down below the recipe to see all of the yummy goodies! This post may contain affiliate links. I earn a small commission for my endorsement, recommendation, testimonial, and/or link to some products or services from this website. Your purchase helps support this blog at no additional cost to you and allows me to continue bringing you delicious recipes and great information. For more information see here. If you’d rather skip my helpful tips, tricks, essential cooking information, and delicious similar recipe ideas – and get straight to this recipe – simply scroll to the bottom of the page where you can find the printable recipe card. It’s right there with a pretty bright yellow background. If you have any questions about how to make this recipe, or if you try them, please come back and leave a comment below letting us know how it goes. Now, normally I would have made the cookie crumbs in the food processor, that would be the easiest way to make them, and the way I would recommend. However, in this case, we are staying in our shabin. (A term I’ve adopted from my wonderful neighbor, Mary. It stands for shabby cabin! I love it!). And, well, lets just say that I don’t have all my cool kitchen toys like a food processor. I didn’t even have a hand mixer before I started making these cheesecake bites. I had to go buy one. If you don’t have a food processor either, the cookie crumbs can be made in a plastic ziptop bag. Take a rolling pin to crush them, if you have a rolling pin, which I don’t, I had to use the bottom of a measuring cup to crush the cookies. But, they still came out great! I decided to use the whole box of cookies rather than have a little bit leftover. For the garnish on these cheesecake bites, I decided to use a little espresso powder (my husband’s suggestion). And, then I topped some of them off with hot fudge sauce! So super amazingly delicious! And so easy. Everyone will love these, and you’ll love how easy they are to make! Check out all the other lovely NO BAKE recipes below from bloggers who took part in our 30 Day No Bake Dessert Challenge. Creamy No-Bake Black Forest Pie by Who Needs A Cape? If you like seeing my recipes subscribe via email in the upper right, or with push notifications using the red bell. Pinterest, Facebook, Instagram, and Twitter! For the crust: in a medium bowl, combine the cookie crumbs and coconut oil, stirring until well combined. Press the mixture into the bottom of an 8x8-inch or 9x9-inch pan. Refrigerate until the filling is ready. For the filling: In a large bowl, using an electric hand held mixer or an electric stand mixer, mix the softened cream cheese, powdered sugar, vanilla, and salt until smooth, about 2-3 minutes. Add the sour cream and cream, and continue to mix until the mixture is thickened about, 4-5 minutes. Add the espresso powder and gently mix in. Spread the filling evenly over the prepared crust. Cover with plastic wrap and refrigerate at least 4 hours or up to overnight. Serve plain, or garnish with a sprinkling of espresso powder and/or a drizzle of hot fudge sauce. Looks really great! And since it has espresso I would love it even more! Wow! What a winning combination of delicious flavors!!!! Can’t wait to try this recipe!!! Oh boy! That photo of the chocolate dripping down the sides is such an oooey goooey delight! I really need to have these in my life! I’m seriously in love with these, Debi! Positively delightful! These really look amazing, what a great no-bake dessert!! Espresso in cake form? How can you go wrong? I would truly want to begin my day with a slice of this yumminess!!! I love any type of coffee flavored dessert! This one sounds like a complete winner! These bites are calling my name….need to make them ASAP! Oh my goodness, there are NO WORDS for how amazingly delicious these look, Debi. I would have to eat the whole pan … no sharing involved! Ooooh, all these No Bake cheesecakes sound so delicious. 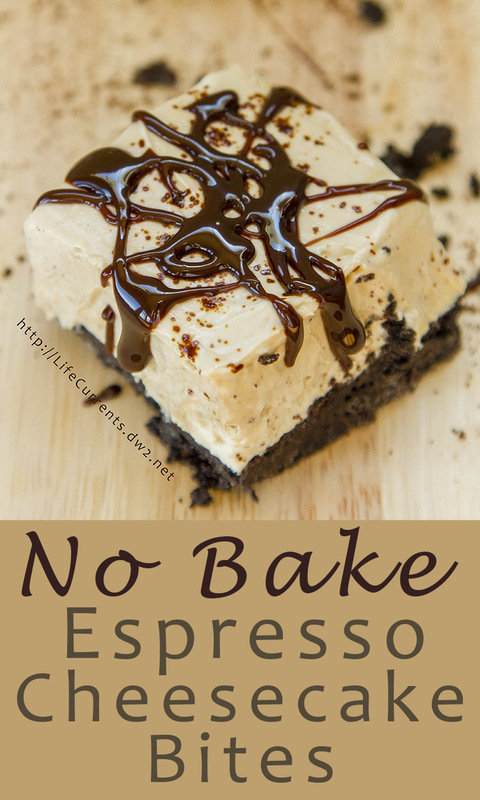 I can’t wait to make your no bake espresso cheesecake bites first — love adding coffee flavor.